Modern varieties of Guzmania lingulata (also known as Scarlet Star) are smaller than older strains. 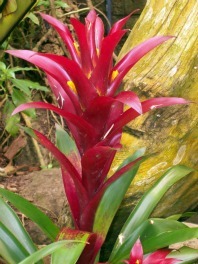 Scarlet Star is one of the most popular bromeliad house plants. Mature plants reach a size of 10 in/25 cm tall, with a width of 12 in/30 cm wide. Cultivars produce blooms in a variety of colors, such as bright yellow, orange, mauve, and lavender. In three to four years, Scarlet Stars produce brightly colored bracts (a flower spike in the center of the plants), which emerge above the glossy foliage in the center of the plants. When the flower spike fades (6 weeks or more after it appears), pups appear near the base of the plants. Small white flowers are almost hidden amoung the bracts. Plants bloom once and then fade over a period of three years. This bromeliad appreciates high humidity; however, it does not require the amount of light that other bromeliad species require, and will often grow in the bright artificial light of offices. This bromeliad prefers moderate to bright light year-round. Avoid direct sunlight. Scarlet Star will grow under the bright fluorescent lights found in offices. Average to warm temperatures year-round (65 - 80° F / 18 - 27° C). Feed monthly year-round with a houseplant fertilizer diluted to ½ the regular strength. Apply fertilizer to leaves, roots, and reservoir. Keep cup filled with a minimum of 1 in / .2.5 cm of water at all times. Roots should be lightly moist. Replace the water in the cup with fresh water every two to three weeks. To remove excess salt build-up, leach bromeliad pot once during the summer. Use a bromeliad or orchid potting soil. When the offsets are 3 in / 7.5 cm tall, they are ready to be repotted. Be sure to provide high humidity for a month after propagating the offsets. Continue to repot annually in the spring until the bromeliad fills a 6 in / 15 cm pot. Small pots can induce blooms in mature plants. Individual plants live three to four years. There are a variety of hybrids available. The bracts of ‘Orange Star’ are long-lasting. ‘Luna’ produces a mauve spike. Other varieties produce red, orange, yellow, and lavender blooms. ‘Rana’ produces a large, orange-red flower spike. Display on a windowsill that receives bright, indirect light. Guzmania lingulata will grow under the fluorescent lighting found in offices.